Equipment can be used for the most various products, starting from auto windshield cleaning agents and finishing with sauces for pizza or cut olives in the pickle solution. Conditions of filling and using Z-belt bags allow products to be kept under room temperature during long time. Packaging system G-NOVA can use bags of different volume from 70ml up to 10L but economic efficiency can be achieved with volume of bags from 0,5/1 L up to 5/10L. Different kinds of flexible laminated films, produced by Goglio are used for packaging production depending on type of product and its processing. The use of Z-belt bags allows in a quick and simple way to re-adjust the system for production bags with new sizes, of new types and design. 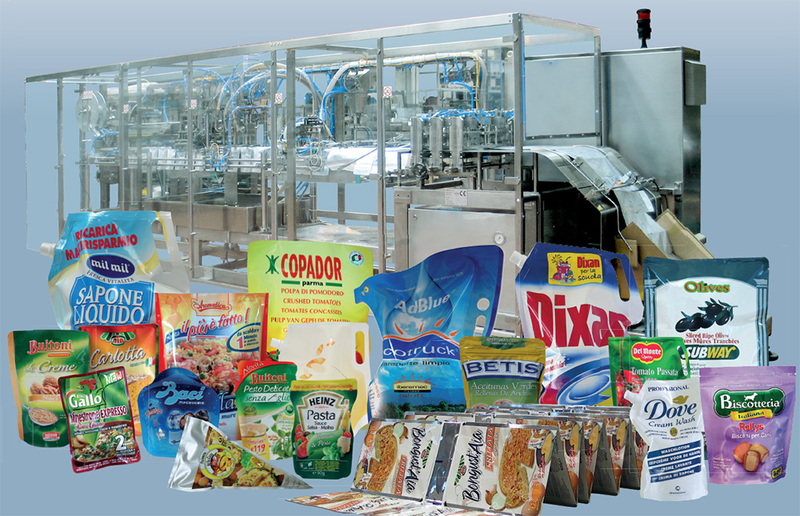 Equipment can function with different formats of bags – flat and doy-pack ones, with dispensers and handles, produced from different kinds of films and laminates. - open and 100% stainless steel structure guarantees massive wash-down procedures. - pre-made z-belt allows quick and easy size, shape and pack type changeover. - clear and easy way of packaging control. Equipment and packaging materials are produced by Goglio SpA – the leader in the flexible packaging solutions with headquarters in Italy. Goglio company has huge experience in flexible packaging and produce a wide range of equipment and bags for liquid, paste-like and other products.